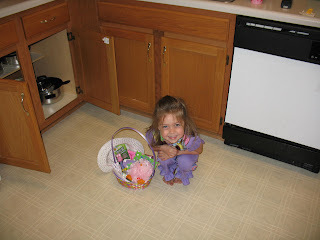 I hope everyone had a great Easter. 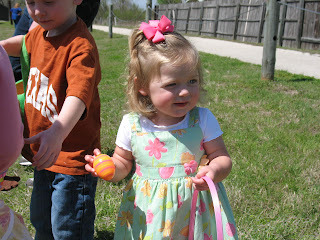 We went to our neighborhood Easter Egg hunt Saturday and got there like 20 seconds after it started and missed the whole thing. Our friends shared with Jaeden and Avery though, thanks! 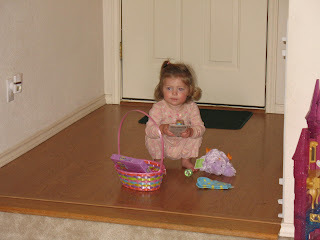 Easter morning the Easter Bunny hid the girls Easter baskets and Jaeden found hers with the pots and pans and helped Avery find her's in the closet. We had fun playing with the bubbles and playing with their little stuffed chicks. We had a great day and hopped everyone did as well! Jaeden is getting so big!! 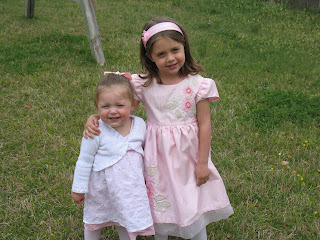 I am so excited to have a girl to buy an Easter dress for!!! Your girls are beautiful!